Elle Decor features Monelle's home :: Gorgeous! I am very excited to share loving. living. small. 's newest A SMALL CHAT interview with the lovely and talented Monelle Totah, VP of Design for iconic brand, Williams-Sonoma. I blogged about Monelle's chic, elegant yet completely comfortable San Francisco home in Elle Decor last summer. Simply put - I loved it. The design, the style and the presence of Monelle's space went straight into my inspiration notebook. Flash to earlier this year and I had the pleasure of writing a bit for the Designer Marketplace, the Williams-Sonoma Inc brand site. Through my work, I had the pleasure of meeting Monelle. She's been with the company for many years and has had a major hand in creating and styling the look and tone of Williams-Sonoma as we know it today. I recently asked to interview her for A SMALL CHAT to share with you all. I’VE ALWAYS LOVED INTERIORS – COLOR, TEXTILES, FURNITURE – I STARTED AT WILLIAMS-SONOMA AND HAD THE AMAZING OPPORTUNITY TO WORK WITH THE COMPANY’S FOUNDER, CHUCK WILLIAMS, STARTING CHAMBERS CATALOG – TRAVELING TO FIND THE MOST WONDERFUL ARTISANS OUT THERE, SEARCHING FOR THE BEST OF THE BEST. THIS WAS REALLY THE START OF MY RETAIL CAREER. THE DESIGN PORTION BEGAN WHEN WE STARTED SEEING ANTIQUES THAT INSPIRED US AND WE WANTED TO PRODUCE PRODUCTS THAT HAD THE SAME AFFECT ON OUR CUSTOMERS -- IT WAS AN EVOLUTION FOR SURE – BUT ONE THAT STILL REQUIRES A PASSION FOR PRODUCT!! I ALSO LOVE TO ENTERTAIN SO GETTING INVOLVED IN WILLIAMS-SONOMA TABLETOP DESIGN HAS BEEN GREAT FUN...I LOVE TO SET A TABLE AND HAVE A DINNER PARTY! 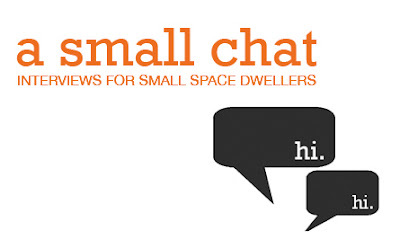 Many small space dwellers need to be thoughtful and edit their accents to create a harmonious home. 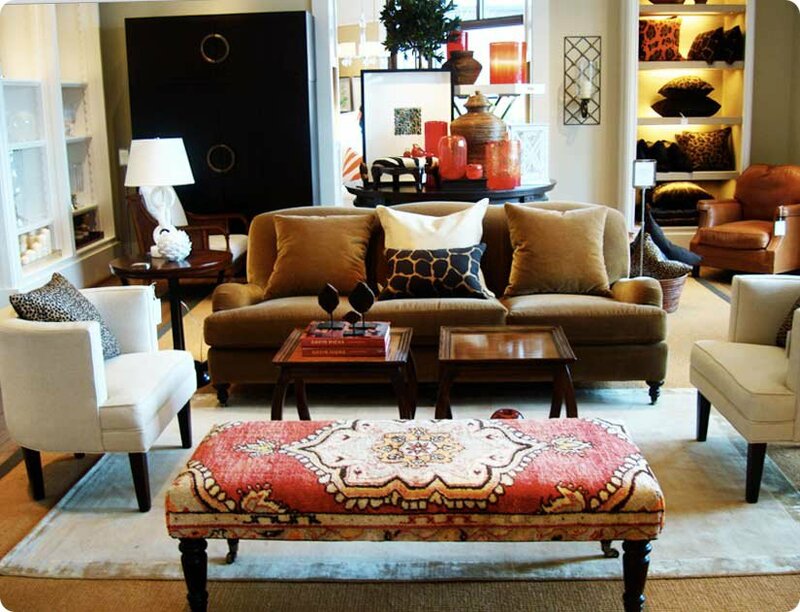 This can often be a struggle since there are so many amazing furniture and decor pieces in the marketplace. What are your best tips for editing a space and what are your suggestions for when you "have to have that new item" in an already full space? I AM THE QUEEN OF “HAVE TO HAVE’ AND TRUST ME, MY HOME IS NOT HUGE...MY FAVORITE TIPS TO CHANGE THINGS UP WHEN A NEW COLOR OR TREND INSPIRES YOU : COLLECTIONS – SMALL COLLECTIONS GIVE A ROOM THAT FEELING OF INSPIRATION AND SURPRISE – SILVER MATCH STRIKERS, BOXES...BOOKS: I LOVE A GREAT DESIGN BOOK, AND AM OFTEN INSPIRED BY A GREAT COVER OR BINDING, A STACK IN A COLOR CAN ADD POP TO A ROOM ..PILLOWS: WHETHER THE TREND IS CORAL, EQUESTRIAN OR A POP COLOR, A COUPLE OF NEW PILLOWS TAKE UP NO SPACE AND GIVE YOUR ROOOM A WHOLE NEW FEEL. ARTWORK – COLLECTING GREAT PIECES OVER TIME, NOT NECESSARILY EXPENSIVE BUT PIECES THAT PUT A SMILE ON YOUR FACE – FLEA MARKETS ARE GREAT FOR SKETCHES THAT YOU CAN FRAME IN DIFFERENT FRAMES – AND IF YOU HAVE ANY INKLING FOR PAINT AND GREAT WHITE CANVAS, MAKE YOUR OWN JACKSON POLLACK. You've had a long and exciting career with Williams-Sonoma that often including product design and style. Color and texture play an integral role in creating dimension in a small space. Can you share your thoughts on using color and texture, how to mix and match and what colors work best for small space living, if there is one? SMALLER SPACES REQUIRE A “CLEAN CANVAS” TO START – I WOULD START WITH NEUTRAL UPHOLSTERED PIECES AND THEN PILE ON THE COLORS AND TEXTURES. I AM A FAN OF LINEN OR A BRUSHED CANVAS – THERE ARE GREAT NEUTRAL TEXTURES OUT RIGHT NOW. DETAILS LIKE NAIL HEADS CAN ADD FLAIR...MIXING AN OLDER ANTIQUES ADDS A TEXTURE ...AND THEN USING YOUR ART, ACCESSORIES AND TEXTILES TO BRING COLOR TO YOUR ROOM – A STRIPED RUG, A TEXTURED PILLOW OR STACK OF BOOKS CAN ADD COLOR WITHOUT TAKING UP TOO MUCH SPACE. Your home in San Francisco was featured in Elle Decor last year and I personally fell in love with your space, design aesthetic and elegant yet comfortable vibe. Your house feels very much like a home, one of the main themes I talk about on loving. living. small. How did you create the design for your space and what personal touches have you included in your home that makes you feel great after a long day? DON’T FOLLOW RULES – EVERYONE SAYS YOU CAN’T HAVE WHITE SOFAS MUCH LESS WITH A BLACK DOG – NOT ONLY DO I, BUT I SERVE RED WINE TOO! A ROOM HAS TO BE LIVED IN...MIXING OLD AND NEW, MODERN W. TRADITIONAL...DO WHAT FEELS RIGHT. COLLECTIONS ARE SO IMPORTANT TO ME - THEY ADD SUCH A PERSONAL TOUCH - I TRAVEL A LOT AND LOVE TO BRING HOME “A TREASURE” - OR WHEN GOING TO FLEA MARKETS I DISCOVER 1 SUGAR SHAKER, THEN ANOTHER AND BEFORE I KNOW IT I AM COLLECTING SUGAR SHAKERS. SMALL SPACES –I HAVE A LITTLE ROOM THAT I RETREAT TO, THERE'S A SMALL TV (YES, I WATCH PROJECT RUNWAY) MY MAGAZINES STACK UP TEMPTING ME TO CURL UP AND READ THEM...SMALL PRIVATE SPACES ARE THE BEST RETREAT – AND IF YOU DON’T HAVE ONE, MAKE ONE – A CORNER IN A ROOM – A COMFORTABLE CHAISE OR CHAIR AND OTTOMAN.